The Oregon triathlon was the second of three sprint triathlons I would complete in seven days. The first of the three, the South Davis Recreation Center Labor Day Triathlon in Bountiful, Utah, was finished. The third was the Tri Turtle Tri in Bremerton, Washington set for the next day. With four days between arriving in Oregon and the next triathlon, Joy and I toured the western part of the state, beginning in Crater Lake National Park. After the better part of a day of stopping for pictures and to read information displays at numerous locations around the crater, we headed toward the southern end of Oregon. The route we chose led us into the northwest corner of California where we connected to Highway 101, also named the Oregon Coast Highway once we re-entered Oregon. During the next three days, we made our way along the entire length of the Oregon coast, passing for a short time into the southern end of Washington state. We had no schedule beyond the need to arrive in Sweet Home on Friday afternoon. So, we took our time, stopping and lingering at places that caught our attention, like Lincoln City where we learned about crabbing (see photo collage below). 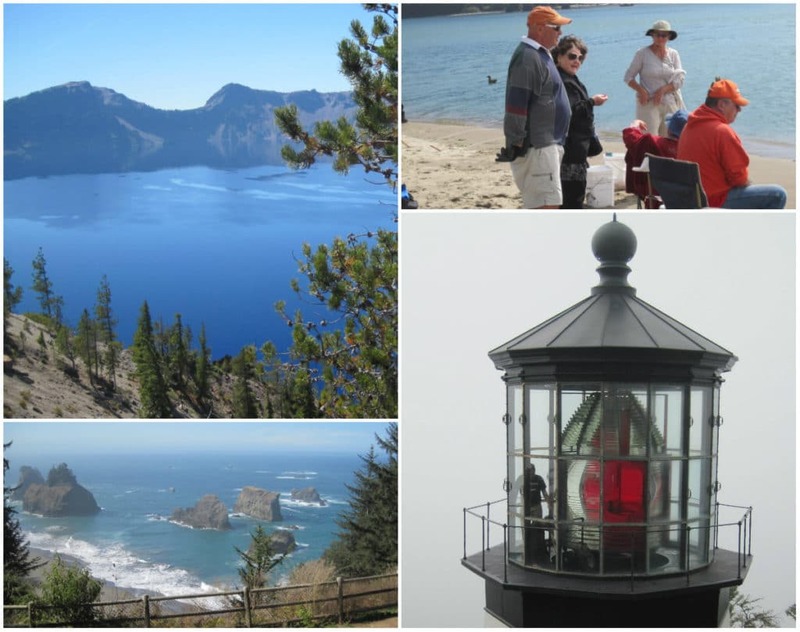 Crater Lake (upper left); Joy receiving instruction on trapping crab (upper right); Top of the Cape Meares lighthouse (lower right); Oregon coast at Arches Rock (lower left). Both of us experienced more than a few jaw-dropping moments while taking in the beauty and diversity of the inland and coastal landscapes. For lunches and dinners, we took advantage of our proximity to the Pacific Ocean to partake of the local seafood. The most memorable of these meals was during our overnight stop in Florence. It was at the Waterfront Depot Restaurant that we enjoyed the most scrumptious halibut, a crab encrusted fillet with a sweet chili sauce, that either of us has had, even to this day. By Friday afternoon, we arrived, as planned, into Linn County, the “Grass Seed Capital of the World”, and Sweet Home, the host city for the Oregon triathlon. While registering for the race, I noticed that the call for race volunteers came with the offer of free camping within Lewis Creek County Park. Joy and I decided that she would volunteer for the race, in part so we could take advantage of this offer. We had purchased a two-person tent intending to camp at the park on Friday night. Camping offered two benefits. First, it would save the cost of a hotel. However, second, and even more importantly, it would avoid us having to rise before dawn to get to the race site around the time of the opening of the transition area. However, it became clear that camping was no longer our first choice for the evening once we arrived at Lewis Park for packet pickup on Friday afternoon. Sure, the park was gorgeous, and it had all the essential facilities. However, temperatures in the high 80s °F and unseasonably high humidity made the thought of camping completely unappealing. We had both become too accustomed to climate control, not to mention mattresses, for a good night’s rest while in a tent in these conditions. One of the volunteers at packet pickup told us that the hotels within Sweet Home were fully booked for the weekend. However, thanks to a last-minute cancellation, we were blessed with the availability of a clean, air-conditioned motel room. Triathlon tip: Some have called triathlon ‘a rich man’s sport’ because of the cost of equipment, nutrition, registration, travel to the event, and more. However, there are several ways to minimize the costs, such as camping at the race venue when available and using the suggestions in this post from Training Peaks. Headquarters for the Best in the West Triathlon Festival was Lewis Creek County Park, in Willamette Valley a few miles east of Sweet Home. The park is home to Foster Lake, a reservoir created by a dam along the South Santiam River. The Best in the West Triathlon Festival, managed by Best in the West Events, was a two-day affair. Saturday included sprint and half Ironman distances of the triathlon and duathlon races. In addition, each of these included relay versions in which two or three participants shared a leg of the race. On Sunday, college men and women competed in the Olympic distance race. Others, called ‘age groupers’, raced in Olympic distance triathlon and duathlon events as individuals or as part of men’s, women’s, or coed relay teams. Sunday also included events for children and those wanting to “test the water” with triathlon. Kids competed in either a short or long course swim and run. There was also a ‘Try-a-Tri’ distance for both children and adults. For this event, the distances for each of the three sports was roughly half those for the sprint triathlon. More information about the various races is on the event website. Saturday’s event began with the half Ironman triathlon swim. Sprint distance racers started once all the half Ironman racers had finished the swim and were on their bikes. While the air temperatures were warm, the water temperature was below 78⁰F making the race ‘wetsuit-legal’ according to USAT rules. Before the start, we waded into Foster Lake to about chest depth. Here we waited for the start signal which, for this race, was produced by a real shotgun. With the shotgun blast, we swam away from the beach toward the first orange buoy (visible above the horse’s neck in the above picture). At the orange buoy, we turned left and swam to a second turn buoy. At this second buoy, we made a second left turn and swam back to the beach. Upon reaching the beach, we jogged into the transition area. The flat bike course ran along the northern edge of Foster Lake following North River Road. After 2-1/2 miles, we reached the end of the lake; the end containing Foster Dam and a small hill that drops about 100 ft (30 m) over a quarter of a mile. The course continued about 3-1/2 miles to the turnaround on a residential street in the northwest corner of Sweet Home. From here, we rode back along the same route as we had just covered. This time, we climbed up the hill at the dam. The run course covered a short distance of grass and a wooden footbridge. Other than those, the run was on paved roads and trails within the park. The gradual rolling hills with climbs of 50 to 70 feet (15 to 21 m) provided enough challenge to make the race interesting. However, the shade and overall beauty of the tree-lined paths made for a pleasant finish to the triathlon. I finished last of those in my age group (males age 60-64). However, for this race, it was also a third place finish which qualified me for one of the awards given to the top three finishers in each age group. The award (pictured below) was among the most unique I have received to date. 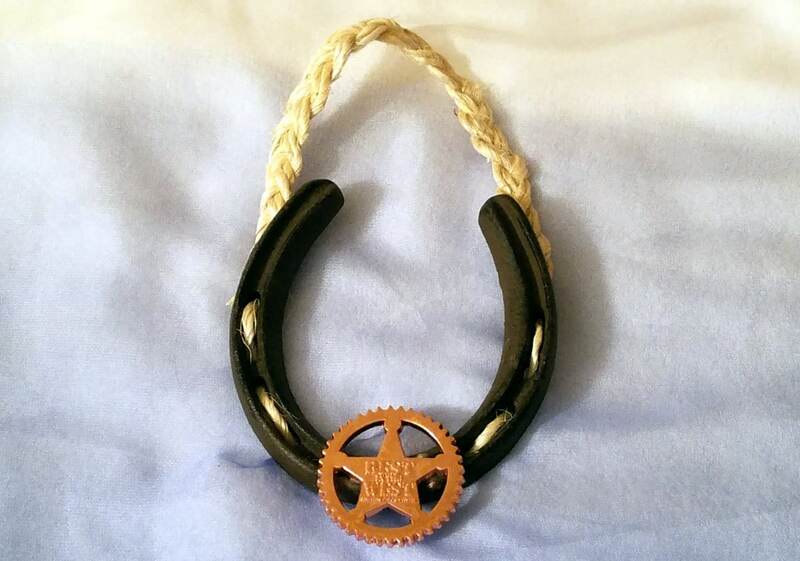 You can see other novel awards at “5 Unique Triathlon Medals; They are No Longer Just Metal”. Age group award from the Best of the West sprint triathlon. Following the race, we rushed back to the motel for a shower before returning to the park for the awards ceremony. It was then back on the road to make the five-hour drive to Bremerton, Washington. Our goal was to reach there in the late afternoon in time for packet pickup for the next day’s triathlon. Spoiler alert: we made it in time. First triathlon with a “shotgun start” involving a shotgun.